Space Exploration Technologies, Corp, or SpaceX, began in 2002 with the goal of lowering the costs of space transportation and one day colonizing Mars. SpaceX has frequently innovated, pushed technological boundaries, and achieved milestones no other private company has come close to emulating. With so much hoopla around the company and its charismatic CEO, Elon Musk, you might be wondering how to buy SpaceX stock? What Is SpaceX Stock Value? Since inception, SpaceX has notched up an impressive list of achievements. It launched the first privately funded liquid-propellant rocket to reach orbit and became the first private company to dock a spacecraft at the International Space Station. Being first to accomplish major milestones is nothing new for SpaceX, which is the first privately funded company to land an orbital rocket via propulsion. And it was also the first to launch an object into orbit around the sun for the first time. The successes have not thwarted Elon Musk’s ambitions. He expects SpaceX to create the largest fully reusable rocket in history within a few years. So how do you get on board this rocket ship and profit from its gravity-defying growth? For investors keen to get in on the space transportation business, here is some bad news. 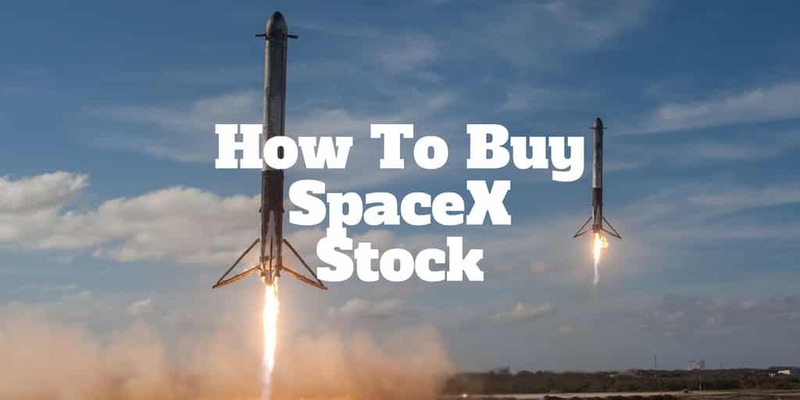 You won’t find a SpaceX ticker symbol or stock price featured on your favorite broker’s list of stocks available to trade. A search for SpaceX stock graph or stock quote will come up empty at thinkorswim, TD Ameritrade, or tastyworks. That’s because SpaceX is a privately-held company and only a select few investors own equity. Back in 2008, a San Francisco venture capital firm, called Founder’s Fund invested $29,000,000. But that’s not going to benefit you, unless of course you work on the investment team at Founder’s Fund and own equity! In 2012, another venture capital firm, DFJ, committed $30,000,000 in exchange for a piece of the SpaceX stock pie. You might be thinking at this stage that there is no way to buy SpaceX stock, and technically it is true that you cannot directly invest in SpaceX. However, Founder’s Fund and DFJ weren’t the only companies to see value in buying a stake in Space Exploration Technologies, Corp. In 2015, Google and Fidelity joined the fray by ponying up $1 billion collectively in a deal that valued SpaceX at $10 billion. The funding was intended to finance the emerging satellite business that SpaceX envisioned would create a global communications system unlike any other. The idea was to place a network of hundreds of satellites into orbit with a view to connecting everyone on earth to the web, as well as future inhabitants of Mars. Like DFJ and Founder’s Fund, Fidelity is a privately owned company so if you want to own SpaceX stock, albeit indirectly, the only option available to you is to purchase shares of Google’s parent company, Alphabet Inc. According to Forbes, SpaceX raised another $507 million in 2018 to bring its valuation up to $25 billion. That would effectively mean the investment Google and Fidelity made just a few years earlier increased in value from $1 billion to approximately $2.5 billion. Venture Capital research firm PitchBook reported that Elon Musk directly purchased another $100 million worth of SpaceX stock. Fidelity also joined in the funding round, following their earlier investment. With seven successful launches of its Falcon Heavy Rocket, the SpaceX stock graph would defy gravity if it were publicly traded but alas it is not. All we can do is watch from the sidelines and view the current SpaceX share price which is pegged at $169 per share. Since inception, SpaceX has raised over $2 billion in funding and its deep coffers have produced enormous growth in the SpaceX stock price and valuation. If a SpaceX stock IPO were to take place today which brought the company public, it would value the equity at $25 billion. However, Elon Musk has been vocal in saying that he worries about taking the company public in case his long term vision to colonize Mars is thwarted by short-term focused investors who care about quarterly profits. Following a SpaceX IPO, shareholders would receive voting rights that could dilute Musk’s control over the direction and strategy of the company. As a result, he maintains a tight grip at the helm and keeps SpaceX private so you won’t find it traded on public stock exchanges, like the NYSE, or even on Yahoo. For space observers who simply want to track completed missions and find out when the next SpaceX launch is taking place, visit this link to SpaceX Missions. Do You Know Of Any Other SpaceX Alternatives That Are Good Investments? We would love to hear from you in the comments below.